Human African Trypanosomiasis, also known as sleeping sickness, is a tsetse fly-borne parasitic disease that is fatal if left untreated. Thirty-six sub-Saharan countries are endemic for trypanosomiasis. Both human and animal trypanosomiasis is considered a major obstacle to sustained economic growth. The animal disease causes immense human suffering through loss of the critical animal components, which are central to most African small scale agriculture. In the tsetse-infested areas, trypanosomiasis reduces the output of meat and milk by at least 50%. Accordingly, it is ranked among the top 10 global cattle diseases impacting on the poor and estimates of the cost of the disease to livestock keepers and consumers vary between US$1 and 5 billion annually. Trypanocidal drugs (e.g. homidium bromide) have been extensively used in animals (35 million doses/year), but drugs are expensive and toxic and resistance has been reported in at least 13 countries. Our laboratory works on trypanosome lytic factors (TLFs), which are antimicrobial high-density lipoproteins that contribute to primate innate immunity. TLFs are characterized by their ability to kill African trypanosomes, which are extracellular protozoon parasites. The unique protein components of TLF are hemoglobin binding protein, Haptoglobin-related protein (Hpr) and a pore forming protein, apolipoprotein L-I (apoL-I) (Fig.1). Figure 1: Mechanism of killing of African trypanosomes by TLF. TLF is bound via two of the protein components Hpr and hemoglobin in the flagellar pocket to a receptor and endocytosed by the parasite. TLF is activated in the acidic lysosome and apoL-I is released from the particle and inserts into the lysosomal membrane forming a monovalent ionic pore. The activation can be blocked by the weak base ammonium chloride (NH4Cl), which neutralizes acidic compartments within the parasite. The pore allows the equilibration of ions down their concentration gradients, leading to the dissipation of membrane potential and the influx of water, such that the parasite swells and bursts. Recently we have discovered that TLF has broad-spectrum activity against other eukaryotic protozoa and prokaryotic pathogens, such as Leishmania sp., Salmonella typhimurium (bacteriostatic) and Bacillus anthracis (bacteriocidal). 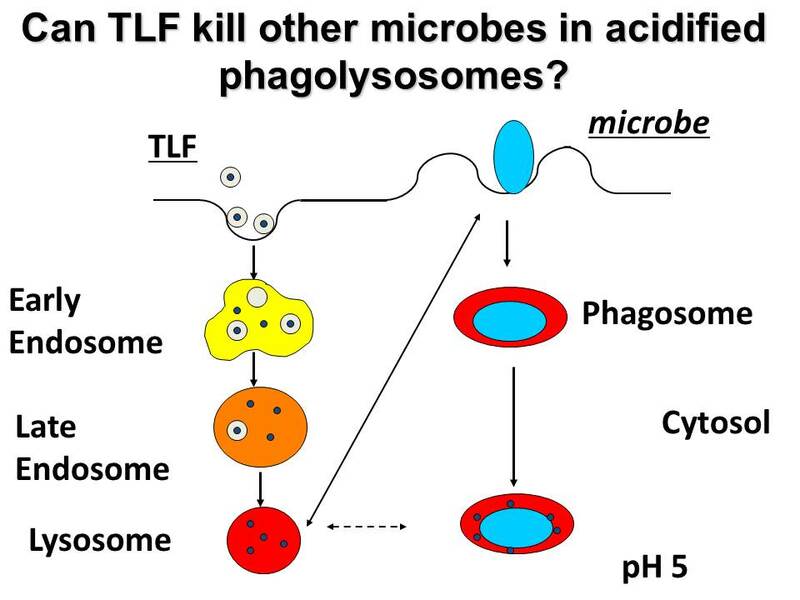 The antimicrobial action requires that the pathogen and the TLF be taken up by macrophages and localize to the phagolysosome (Fig. 2), wherein apoL-I will be activated and form pores in the microbe. Therefore, we propose that TLF is one of our first lines of defense against intracellular pathogens. TLF is a primate specific immune factor ONLY found in humans, some Great Apes and Old World Monkeys. Two subspecies of Trypanosoma brucei have evolved resistance to TLFs and can consequently infect humans and Great Apes, resulting sleeping sickness. However, some Old World Monkeys including baboons are naturally resistant to all African trypanosomes. We have recently isolated the baboon APOL1 orthologue, which is 60% similar to human APOL1. Mice transiently transfected with this gene are protected against human infective species T. b. rhodesiense as well as the cattle pathogens T. congolense and T. b. brucei. Due to this discovery we are developing transgenic cattle that carry baboon APOL1 and will evaluate their ability to resist infection. We are elucidating the critical changes in the baboon apoL-I protein that allow it to kill human infective parasites. We find that lysines in the C-terminus are required to evade neutralization by human infective trypanosomes. Using biochemical techniques we have deduced that the precise nature of evasion is due to structural differences between baboon and human apoL-I.